Lately, a lot of the news concerning Thor: Ragnarok has revolved around The Hulk’s involvement and Cate Blanchett’s rumored villain, but what about the existing players in the God of Thunder’s world? So far the only characters are Thor himself (obviously), Loki and Lady Sif, though there’s a strong possibility that Odin will be back as well. Meanwhile, there are still quite a few who have yet to be officially announced for a return, including Volstagg, one of the Warriors Three. I’m not sure, to be honest with you. … Would I love to be involved in that? I hope so. However, even if I’m not, I just wish [Marvel Studios] continued success in their incredible endeavor. He also added that until he signs on the "dotted line," it’s up to the "powers that be" to decide whether Volstagg (or any character) will be right for the story. Stevenson, whose previous Marvel experience includes playing Frank Castle in 2008’s Punisher: War Zone, is currently starring as Blackbeard in the Starz series Black Sails, so he would have to make sure his TV schedule doesn’t conflict with Thor: Ragnarok’s production. 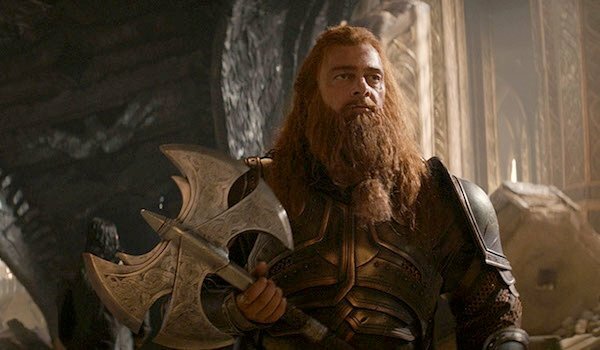 As Thor’s brothers in arms, Volstagg, Fandral (currently played by Zachary Levi) and Hogun (played by Tadanobu Asano) helped out the God of Thunder during the first and second movies, from trying to get him in and out of Asgard undetected to wielding their respective weapons in battle alongside him. They may not have left a giant impact on these stories, but their presence has been welcome nonetheless. Of course, if Stevenson does get the call to come back for the 2017 blockbuster, ideally he’ll be alongside the other two members of the Warriors Three. It would be weird to have Volstagg without his companions, Fandral and Hogun, or vice-versa. It’s like ordering a BLT without any bacon. Sure, the other ingredients are fine individually, but only when they’re all together do they get to shine. Also, keep in mind that Thor: Ragnarok will most likely revolve around the journey to stop that apocalypse from wiping out Asgard and the rest of the Nine Realms. So to not have some of the most notable Asgardians participating would be odd. Could they die? Perhaps, but we should at least get to see that happen rather than their fates occur off screen. Thor: Ragnarok is expected to shoot this June in Australia, so the top brass will need to let Ray Stevenson know whether they’ll require him or not. Fans can look forward to the movie hitting theaters on November 3, 2017.